People often ask how scientists decide what projects to work on. Part of the answer is scientific opportunity – the sense of being able to understand a scientific problem or a disease process at a deeper level than has previously been possible. This is the “how” and “why” of understanding and it depends on being in a competitive position with the right tools and resources to shed new light on important questions. Perhaps an even stronger motivation is when knowledge could have application to improved medical care. This is the ultimate goal for most scientists. We try to balance longer-term knowledge and shorter-term application and deliverables. Both require high quality science with deep foundations and a focus on reproducible conclusions not cutting any corners or using quick fixes. Above all else, this requires excellent people with great training and expertise. It also requires building teams, both within SVI and outside. It is hard to overstate how important finding the right people is – and then supporting them by creating a culture that facilitates excellence and innovation and also has the right technologies available. The sort of people we look for are intellectually and technically capable and curious, have worked at other excellent institutions, are internationally connected and, increasingly these days, have links with industry – and are excellent at collaboration. Good examples of the “right” people featured in this newsletter include SVI veteran Bruce Kemp who was recently awarded the Leach Medal for his lifetime of achievement by the Lorne Protein conference; Stuart Mannering, a mid-career researcher who has recently been in the news for his paper in Science which was a collaboration with scientists at several US universities; and Sophie Broughton and Jess Holien from the Structural Biology Unit, younger and emerging researchers who have both recently received very welcome grants. Along with many other researchers, these are the people who make SVI what it is today. *Acknowledgement: Front photo of Zane Pavlovic and Dr Stuart Mannering by Justin McManus / Fairfax Syndication. Professor Bruce Kemp, Head of SVI’s Protein Chemistry and Metabolism Unit, was awarded the prestigious 2016 Leach Medal at the 41st Lorne Conference on Protein Structure and Function in February. The Leach Medal is presented annually in recognition of scientific excellence, and is named in honour of the eminent biochemist Professor Syd Leach (1920-2005). Bruce joins the list of past Leach Medal recipients including Elizabeth Blackburn, David de Krester, Don Metcalf and SVI’s Jack Martin. The Medal is an acknowledgement of Bruce’s scientific standing. By any metric his work has had an enormous impact internationally. His laboratory has tackled fundamental problems in the regulation of metabolism and signal transduction, exploiting the full spectrum of techniques available, ranging from protein chemistry, biochemistry, structural biology, physiology and genetically modified mice. Congratulations to Bruce, a truly deserving recipient. With no history of type 1 diabetes in the family, Rosina is keenly interested in what causes the disease and why Dane has been affected. These questions are closer to being answered thanks to research from SVI’s Dr Stuart Mannering and his colleagues from the University of Colorado. In their recently published research, the team has identified what may be the initial target of the immune response that causes type 1 diabetes. The discovery provides a plausible explanation for why the immune system mistakenly destroys the body’s cells in type 1 diabetes. When our immune system is functioning properly, it protects us against “invaders” that might make us sick, such as bacteria and viruses. But in people with autoimmune diseases, the immune system attacks healthy parts of the body. In type 1 diabetes, the cells that secrete insulin, called beta cells, are the target of the immune system’s attack. Beta cells live in small clumps of cells called islets, within the pancreas. In research published in the prestigious journal Science, the team showed that fragments of two different beta-cell proteins, called peptides, join together to create a hybrid peptide. This hybrid is recognised as foreign by the immune system’s T cells, and may be one of the early steps in the immune cascade that eventually destroys the beta cells and causes type 1 diabetes. University of Colorado researchers Professor Kathryn Haskins and Assistant Professor Thomas Delong identified the hybrid peptides in a type of mouse that develops type 1 diabetes. However, they needed to determine if their findings held true in humans. They turned to Stuart Mannering for help. Stuart’s team was the first in the world to isolate human T cells from the pancreas of organ donors who had type 1 diabetes. He says that his group has been using these T cells as a tool to dissect what they recognise and respond to within the human beta cells. Stuart says that the work provides a new paradigm for understanding how the immune system might be mistakenly destroying the body’s cells in type 1 diabetes. If the hybrid peptides turn out to be the targets of the initial immune response the researchers will be able to start working on strategies to use them to halt the disease. While Rosina knows that the research is still years away from delivering changes to the way Dane lives with the disease, she still welcomes the news. Funding for the research was provided by the National Institutes of Health, an American Diabetes Association Pathway to Stop Diabetes Grant, the Australian National Health and Medical Research Council, the Juvenile Diabetes Research Foundation, the Diabetes Australia Research Trust and the Helmsley Charitable Trust. For researchers in SVI’s Structural Biology Unit, 2016 got off to a strong start. Dr Sophie Broughton kicked the year off by accepting a grant from Cure Cancer Australia. The Priority-driven Young Investigator Project Grant Scheme has been developed to support project grants by young post-doctoral researchers undertaking a 1 year research project into malignant disease. Sophie’s work focuses on a signaling pathway which has been implicated in the development of leukaemia. By understanding the three- dimensional structure of a receptor which lies at the head of the pathway, Sophie aims to ultimately develop treatments for diseases such as acute myeloid leukaemia. Early in the year, Unit Head Professor Michael Parker and his Postdoctoral Fellow, Dr Luke Miles, were awarded a $48,535 grant from the Bethlehem Griffiths Research Foundation to help screen for drugs to treat Alzheimer’s disease. The same team was also awarded a $58,278 grant from the Mason Foundation’s National Medical Program to investigate ways of activating the immune system to treat Alzheimer’s Disease. The youngest grant recipient in the Unit is PhD candidate Jasmina Markulic, who accepted an Australia Rotary Health Scholarship to support her PhD studies. Hopefully a sign of many great discoveries to come. SVI has recently been happy to welcome some amazing community fundraisers to the Institute. On the 8th of February a group of supporters of the National Breast Cancer Foundation (NBCF) met with Dr Andrew Deans, who was a recipient of a National Breast Cancer Foundation Early Career Fellowship between 2012 and 2016. The NBCF is the leading community-funded organisation in Australia raising money for research into the prevention and cure of breast cancer. All those who toured the Institute had been affected by breast cancer, either directly or through family members or friends. They channelled the experience into a positive: by becoming community fundraisers for the NBCF. On the 22nd of February, the Malkin family visited the Institute with the Leukaemia Foundation. Tach Malkin lost her husband Phil in early 2015, after he had lived with leukaemia for 3 years. With her children Beau and Charlea and inspired by Phil’s love of diving, the family went on to found ‘Phil’s Dive’, a community fundraising event in Bicheno, Tasmania. Held for the first time in November 2015, the event raised more than $35,000 for research into leukaemia. The family selected SVI’s Dr Jess Holien as recipient of the funding, through her Leukaemia Foundation-funded project ‘Designing protein- protein interaction modulators for anti-leukaemia therapy’. SVI’s researchers are inspired by these fundraisers, whose efforts have not only supported their research, but given the researchers another reason to work even harder to make a difference through medical research. Dr Colleen Elso is a postdoctoral researcher in SVI’s Immunology & Diabetes Unit. Her research focuses on identifying the initial target of the immune response in type 1 diabetes. My childhood ambition was to ... be a marine biologist. My first job was ... babysitting children from local families, including one family with six kids under the age of 7! My worst job was ... counting the number of cars going through particular intersections - the absolute worst was doing it from 1am to 4am. My happiest moment was ... hearing my daughter’s first cry. I got into research because ... I have always been curious, wanting to know how and why and what and not being content with ‘that’s just the way it is’ (‘But why?’). The hardest thing I have ever done was ... overcoming my natural shyness to speak in public. If I could live anywhere I would ... choose right here in the suburbs of Melbourne, close to my friends and family. Justin Galvin completed his Honours degree in 2015 under the supervision of Dr Stuart Mannering. He was just 2 years old when he was diagnosed with type 1 diabetes. “I remember my bladder feeling extremely full and not being able to hold on. I then remember being hastily carried by my mother to the toilet. My auntie, who witnessed the event, has a son with type 1 diabetes. She advised my mother to rush me to the hospital, and the next memory I have is of sitting in the hospital bed at night with my distressed mother by my side. My grandma on my mother’s side also has type 1 diabetes; my family was devastated when I was diagnosed. I feel lucky though, to have had my auntie detect the symptoms early and for my parents to have support and guidance from someone who understands the disease. I haven’t let diabetes keep me from having a full life. I was very active when I was growing up and was involved in lots of sports including swimming, tennis, kickboxing, rugby league, and basketball. On top of this I was riding my bike every day after school. I feel being active has helped me keep the disease in check. My primary school teachers were also very kind and helpful. I remember in Grade 1 the librarian would come and get me from class if I had high blood glucose levels. She would take me to the library to help organise the books for some exercise. I have always been on insulin injections, but I would love to move onto an insulin pump to better control my blood glucose readings, especially now as I have a mostly sedentary lifestyle studying. Unfortunately, an insulin pump is quite expensive. When I finish my medical course I’d like to have the freedom to pursue any specialty without my health limiting me. I’m quite worried about losing my sight or needing to go on kidney dialysis; I want to live a long and healthy life. I hope that more funding is put into medical research, and that one day there is a cure for those who currently live with the condition. In the meantime, I would like to see some advancement in technology so that insulin can be administered safely in a non-invasive way. I hope to incorporate research into my future clinical career. SVI was proud to see Foundation Chair Sue Alberti appointed a Companion of the Order of Australia (AC) in the Australia Day honours list. 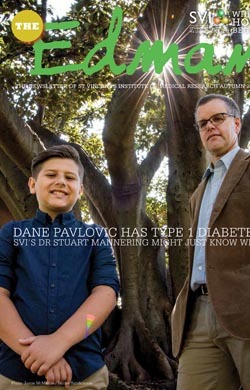 “There is no doubt that Sue’s passion and commitment to funding medical research, particularly in the area of type 1 diabetes, has had a long-term and positive impact on the quality of life for people living with the disease not only here in Australia, but across the globe,” SVI Director Tom Kay said. The AC is the highest commendation given and Sue was one of only three women to receive the award this year. Sue has been the recipient of two previous Order of Australia Awards; a Member of the Order of Australia (AM) in 1997 and an Officer of the Order of Australia (AO) in 2007. Sue has been Chairman of the SVI Foundation Board since its inception in 2004 and in that time has contributed close to $2 million to the Institute, particularly towards type 1 diabetes research; this includes hundreds of thousands of dollars raised for SVI through the Susan Alberti Medical Research Foundation’s Signature Ball. She has been a driving force behind numerous fundraising activities at SVI and a very active board member. There is no better person to demonstrate the power of a Bequest than racehorse trainer Jack Holt. Without his Bequest SVI would not exist today. The Jack Holt Society consists of a group of generous supporters who are following in his footsteps to ensure that they too can positively impact the future of SVI and medical research. On Friday November 20, 2015 The Jack Holt Society celebrated its fourth anniversary with morning tea held in the Canberra Room at The Hotel Windsor. The event, which is always a warm, welcoming affair, is an opportunity for fellow members to catch up and be updated on the Institute’s latest news. SVI supporters also get to meet members of the Society and learn more about how they too can leave a Bequest. As emcee of the morning, SVI’s Associate Professor Jock Campbell spoke about his heart disease research at the Institute and highlighted the importance of philanthropic support. This notion was emphasised by SVI’s Professor Jack Martin who shared Jack Holt’s story with the guests. Susan Alberti AC, Chair of the SVI Foundation, shared her passion for type 1 diabetes research and how important it is to her to be a member of The Jack Holt Society. Kathy Wilson, a Special Counsel in Aitken Partner’s Will, Estates and Succession team, addressed the basic steps of including a charity in your Will. The Patron of the Jack Holt Society, Gerald Snowden, shared his personal story of why he became a supporter of SVI. As Patron, he plays a very active role and has organised and invited many groups to come and tour the Institute over the last 4 years. For the last 3 years, the Susan Alberti Medical Research Foundation’s Mother’s Day Luncheon has raised vital funds to support the careers of women in research at SVI. The most crucial years in a female researcher’s career often coincide with childbearing and raising small children. The Women in Research Award presented at the luncheon provides funds to pay a research assistant or postdoctoral fellow to continue the recipient’s work in the lab while she is on maternity leave or working part-time. Last year’s Research Award recipient, Dr Lorien Parker, is the proud mother of 5-month-old Charlie and 2.5-year-old Mae. We sat down with Lorien to discuss what receiving the Women in Research Award meant to her. Why is the Award unique? I think it is fantastic to acknowledge how truly difficult it can be for a woman to successfully manage work and family without having to sacrifice one at the expense of the other. Unfortunately, there is never really an ideal time to have a career break to start a family. Initiatives like this Award facilitate the continuity of research during what can otherwise be a difficult time and can result in significant career and research project setbacks. This in turn often lessens the chance of success in obtaining future funding—an essential ingredient in medical research progress. What did receiving the award mean to you? This Award has allowed me to continue my research, even in my absence, while I spend the first few critical months with my newborn baby. It’s reassuring to know that I have the support of the Institute and the Susan Alberti Women In Research Award, to help me through what I consider one of the most important times of my, and my son Charlie’s, life. I now have the confidence that my work is in good hands while I’m on maternity leave. What are the challenges of working in medical research and how do you overcome them? Medical research is an extremely competitive field that requires a consistent output of ideas, results and publications to secure funding for further research. Career disruptions severely affect the ability to maintain this much needed continuity. The supportive environment at SVI, along with successful collaborations, a good scientific network and a great lab team make succeeding through difficult times possible. There are also some incredibly strong role models at the Institute, who are always generous with their time and advice. There can also be challenges when you return to work as a parent of young children, how do you overcome these? My days are much longer and much more hectic. I am learning to work more efficiently to fit everything in amidst the chaos. Admittedly, some of my best work is done in the peaceful hours in the middle of the night while the rest of the house sleeps. At home, the support of my husband, and at work, the support of my colleagues, is what gets me through. The Institute is also incredibly supportive in understanding that I will return to work for 4 days a week, not 5. They acknowledge that my passion as a mother and a researcher are both important and that both roles are worthy of my time. This Award has provided funding for additional lab staff on my day off. Career highlight? I collaborated with the JAXA (the Japanese version of NASA) and sent my experiments into space...on a rocket ship, on a space station, with real astronauts! They were in orbit for 3 months and due to the no-gravity environment, the results were fantastic, much better than those that I did on earth. We were able to gain significantly more data, compared to the data I got from the ‘earth’ experiments. What keeps you motivated in your role as a researcher? I have always been driven by a desire to understand how things work. We still know so little about diseases like cancer, but every day we are discovering new things and adding pieces to the puzzle. I hope that when my two little people are older, significant advances have been made that can ensure they live long, healthy and safe lives. This year’s Mother’s Day Luncheon will be held on Thursday May 5th, with guest speaker the Honourable Linda Dessau AM, Governor of Victoria. Visit the SAMRF website to find out more information about the lunch or purchase tickets.